Have you ever been browsing the web and wondered just how popular a certain website really is? I know I have. Sometimes it’s a skeptical who-would-actually-read-this kind of thought, and other times it’s more of a wow-more-people-need-to-know-of-this notion. Unfortunately, most sites don’t publish their stats for public viewing so accurate numbers are hard to come by. At best, you can probably look for a website’s “advertising page” which usually includes marketing materials and demographic information — including monthly traffic data. But when that’s not available, your only option is to rely on a website traffic estimator. Because these are never 100 percent accurate, we only recommend using them to compare the traffic of different sites. Even then you should only compare readings from the same tool. SimilarWeb is my estimator of choice when I want to see what kind of traffic a website gets. The real value of SimilarWeb is its Top Website Rankings page where you can the top ranking sites according to category and country (limited to the top 50 for free users), but it also lets you search for a specific domain and see that particular site’s stats. When you look up a site, you get three points of data right away: global rank, country rank, and category rank. These are awesome for seeing competitive health at a glance. 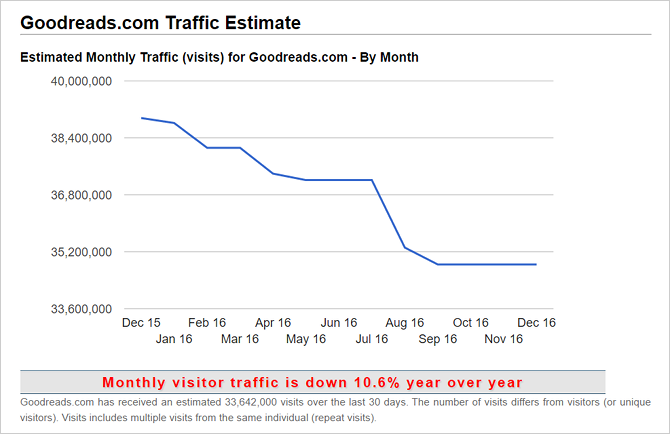 But if you scroll down, you can see the engagement stats: monthly traffic, average visit duration, pages per visit, and bounce rate. Keep scrolling and you’ll see a bunch of other details, such as traffic source breakdown, top referring sites, social media traffic, audience demographics, and more. All of it’s available for free, solidifying this as the best estimator tool. 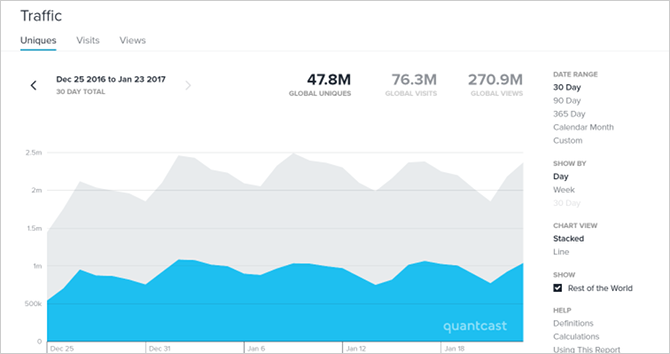 Quantcast is probably the most accurate traffic estimator tool currently available, but it comes with two important caveats: first, its accuracy is still spotty from site to site, and second, its data set is severely limited when compared to sites like SimilarWeb or Alexa. This is due to how Quantcast works: a website must set up Quantcast’s data collection feed on the site itself, which allows Quantcast to start collecting data and estimating traffic. As such, Quantcast cannot accurately estimate traffic for sites that don’t participate. You won’t find sites for most lesser-known websites on Quantcast. That being said, when a site is being tracked, Quantcast offers a lot of amazing data to pore over. The demographic breakdown is especially insightful, which includes visitor ethnicity, shopping interests, media interests, occupations, and political affiliations. SitePrice is actually a website value calculator and not a traffic estimator, but it does include traffic estimates in its value calculations. 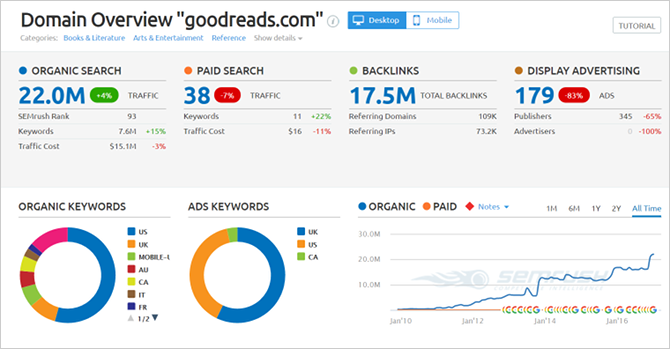 When you look up a site, just scroll down to see the estimated traffic and revenue stats, including daily pageviews, daily unique visitors, and daily ad revenues. You’ll notice that these values are way off from what you’d find on, say, SimilarWeb or Quantcast. That’s because SitePrice pulls its data from several sources (including SimilarWeb and Quantcast) and averages them to get a more “accurate” reading. It’s up to you whether you trust it more or less. Other nifty stats include search engine visibility, backlink counts, domain age, and top competitors. Also, remember that this tool is just an estimator so don’t take its website valuations at face value. StatChest is another site like SitePrice in that its main goal is to estimate the value of a given website based on factors like web traffic, search engine visibility, page speed, social media visibility, etc. Pretty simple and straightforward to use. What’s interesting about StatChest is that its numbers rarely line up with SitePrice’s numbers. It’s unclear how StatChest gets its numbers (an explanation is unavailable anywhere) but when you compare to other traffic estimators, you’ll notice that StatChest’s values are significantly lower than the rest. Perhaps it just wants to err on the side of caution. Traffic Estimate may not be the best-looking estimator tool, but it serves its purpose in a pinch. The estimation graph shows you a website’s traffic patterns over the past year, and you get a numerical traffic value for the past 30 days. It’s pretty simplistic — perhaps too much. Scroll down and you’ll see data on which keywords are targeted by the site. This is helpful to explore which other sites are the main competitors for this site. There isn’t much beyond that. For best results, use Traffic Estimate as a supplementary tool in conjunction with the others on this list. SEMRush is primarily a search engine optimization tool, meaning you’d use it as a website owner to help find and target keywords that will bring you more search engine traffic. However, as a regular web surfer, you can use it to see what kind of search traffic a site gets. Just to be clear, SEMRush won’t give you absolute traffic numbers — if that’s what you’re looking for, turn to SimilarWeb or Quantcast. SEMRush is best when you only care about search traffic and you want to compare search traffic patterns between sites. For that, SEMRush tends to be the most accurate. Like with Traffic Estimate, SEMRush shows you top keywords for a given site, but on top of that, you can see actual numbers and search engine positions for those keywords. You can also filter the stats by country, allowing you to see search patterns on a regional basis. Are There Any Other Tools We Missed? You’ll notice that two oft-recommended tools are missing from this list: Alexa and Compete. Well, if you want to see traffic estimates for websites using Alexa, you’ll need to sign up for the Advanced plan which costs $149 per month, and that’s way too expensive when you can get similar estimates elsewhere for free. As for Compete, it was shut down at the end of 2016. If you know of any other traffic estimator tools, we’d love to hear about them. Let us know which ones you use most often and why you prefer them over the others. Leave us a comment down below!